Pokémon cards have gone through countless changes over the years. Some have been cosmetic, others are strategic and a couple just strange. Regardless, there is always something new to discover with every generation of Pokémon. 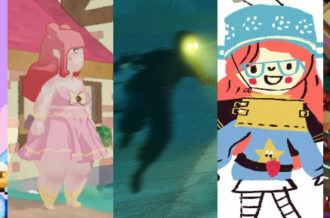 Most recently, Pokémon Sun and Moon, the video game, released around the world for trainers to catch unique Pokémon, encounter powerful beasts, harness bonding attacks and more. It’s a journey unlike any other and now it has all translated to the Pokémon Trading Card Game. We received a couple of themed decks and booster packs to check out, courtesy of TriplePoint and the Pokémon Company. The decks are Bright Tide, Forest Shadow and Roaring Heat. Each one features their respective starter Pokémon on the gorgeously embossed packaging. Each of the Pokémon’s outline poke into the cutout opening which adds a nice touch of how involved they can be with their own decks. Inside all boxes are similar items. A deck of 60 cards, a checklist, one metallic coin, a playmat, deck box and damage counters. The back of the packaging even lists the contents of the Pokémon you will receive along with a few images. Starting off, Bright Tide features the shining star of the sea, Primarina. It contains a shocking mixture of Water and Electric-type Pokémon as well as a few Normal-types. 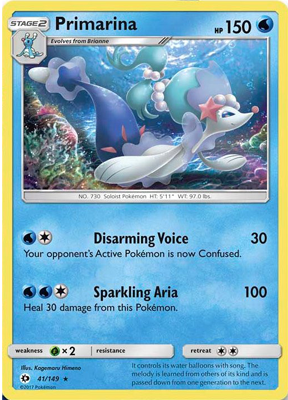 Primarina is the main draw of this deck and with Disarming Voice doing 30 damage plus confusion as well as its signature attack, Sparkling Aria inflicting 100 damage while healing itself, this Pokémon is going to be tough to take down. Primarina is good to use if stalling is necessary as its self-healing will give you time to power up other Pokémon. It has 150HP which is pretty fair and a weakness to Grass-type cards which is good news for anyone using the Forest Shadow set. Also, those looking to experience Alolan region Pokémon, there are only four which means the majority of your team will consist of older Pokémon. Speaking of which, Forest Shadow features the mysteriously shrouded Decidueye. There are only Grass and Normal-type Pokémon in this deck which could help or hinder your battles. 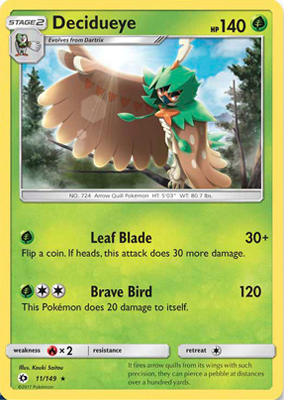 Decidueye uses Leaf Blade to inflict 30 damage but a flip of the coin could double that in no time while Brave Bird deals a whopping 120 damage but can take a toll on the user by hurting itself. Use Brave Bird wouldn’t be the best idea especially with Decidueye’s lower HP total of 140. 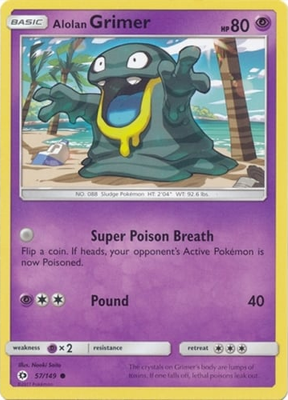 As mentioned before, the use of all Grass and Normal Pokémon means you won’t have to split your energies as much as you would for the Bright Tide deck. However, this will definitely leave you vulnerable to plenty of Fire-type opponents. 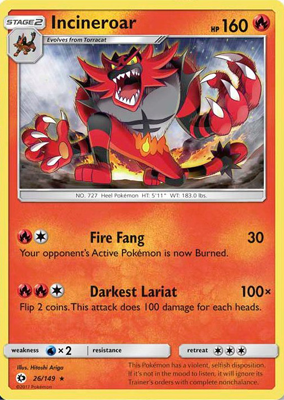 Now, we come to the Roaring Heat deck introducing the crushing power of Incineroar. 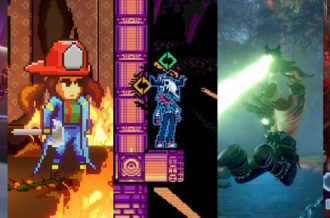 There are Fire, Normal and Fighting-types included with this bundle. Incineroar has Fire Fang which will induce a burn on the opposing Pokémon as well as 30 damage. 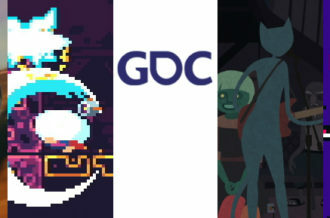 It also uses its signature attack, Darkest Lariat, which you must flip two coins and deal 100 damage, for every heads. This move has the potential to unleash 200 damage, double that for anything weak to Fire-types and it can take down basically anything. Incineroar’s 160 HP makes for a great advantage in order to build up its attacks and keep flipping for heads. While each deck gives you a great basis for building a team, there are brand new ways to play if opening a few booster packs. You know the Alolan region is home to some familiar faces. Some Pokémon from the Kanto region have been given a makeover in generation VII. 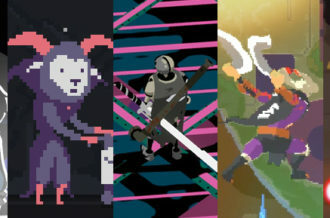 In the Trading Card Game, those few individuals have been given a unique trait which will serve them well in battle. These Pokémon are allowed to use an attack without using up any energy cards. They may be weak or non-damaging but can certainly help. 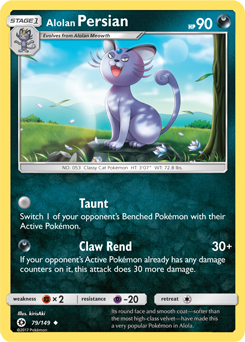 Alolan Persian uses Taunt which allows you to switch your opponent’s active Pokémon with one from their bench. Alolan Rattata inflicts 20 damage with Gnaw. Mixing a few of these into your deck can really throw an opponent off their game. With no energy to use, it makes sense to at least include something that can chip away at the enemy while they try and build up for an attack. It can really mess with their own strategy and frees up room for more cards in your own deck. On top of that new advantage comes the introduction of GX cards. 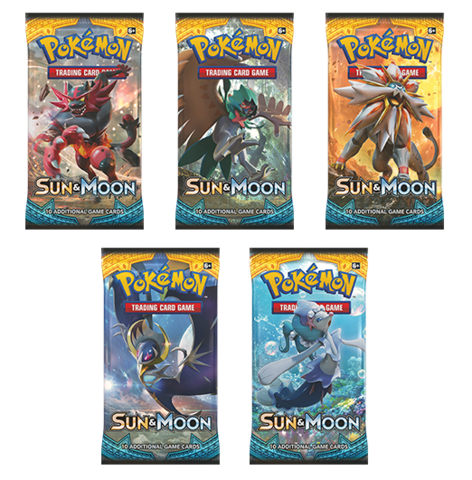 These look similar in appearance to previously released EX cards depicting the Pokémon in the entirety of the card in an action-packed pose. They have unique a unique third attack which can only be used once per battle. This is exactly how Z-Moves work in the video game series. It will up your critical thinking tenfold as there needs to be a precise and necessary moment to use the move. GX moves can differ as well. Certain cards and Pokémon have specific actions and could have consequences. Snorlax unleashes a deadly 210 worth of damage but immediately is put to sleep afterwards. Primarina lets you heal all of your Pokémon but figuring out when is the problem. 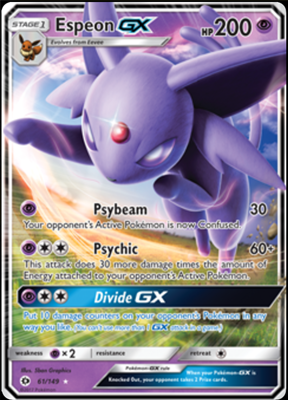 Espeon gives you ten damage counters to place on your opponents team however you want which could lead to a quick victory depending on what’s there. There are currently over seventy new cards to collect from the Sun and Moon expansion. All these new Pokémon, abilities, attacks and items are worth studying as you never know what can happen now. 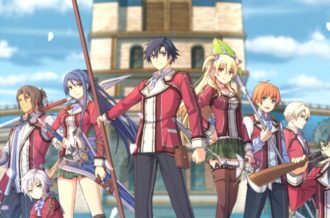 It’s up to you how to build a deck and hopefully reading the information here will help put you on the path to victory. 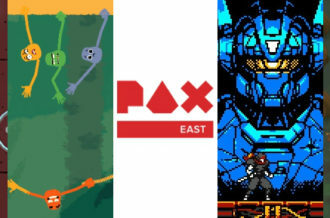 The themed decks and booster packs are just the beginning. Pokémon Sun and Moon are completely rewriting the rules of the Pokémon Trading Card Game. Make sure you are ready for the trials to come.